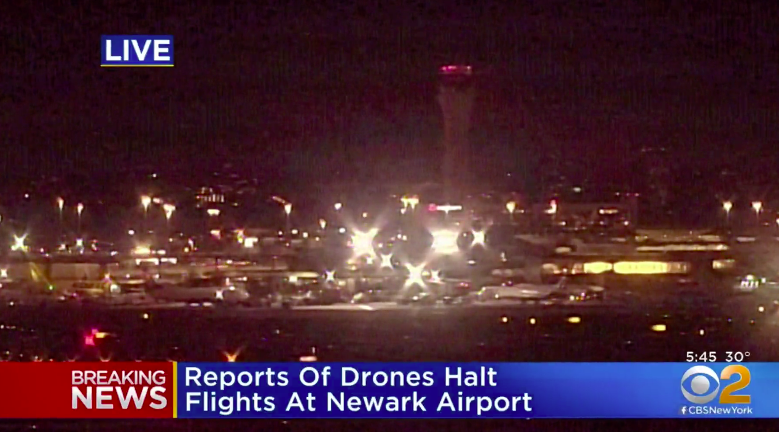 Two drones flying near Newark Liberty International Airport led to a full stop on all flights. The airport, also known as EWR, serves the greater New York City area. Federal Aviation Administration officials said all flights bound to Newark were halted on Tuesday evening, after two UAVs were spotted flying nearby. The drones were sighted about 3,500 feet over Teterboro Airport In New Jersey, a small airport about 17 miles north of Newark Liberty that handles private planes, the agency said. After the sighting, takeoffs from Newark were halted and inbound planes were held in the air. By 5:45 p.m., planes had resumed landing at Newark, but planes headed for the airport from other cities were blocked from taking off, the agency said. Newark is one of the three main airports serving New York City and the surrounding region.